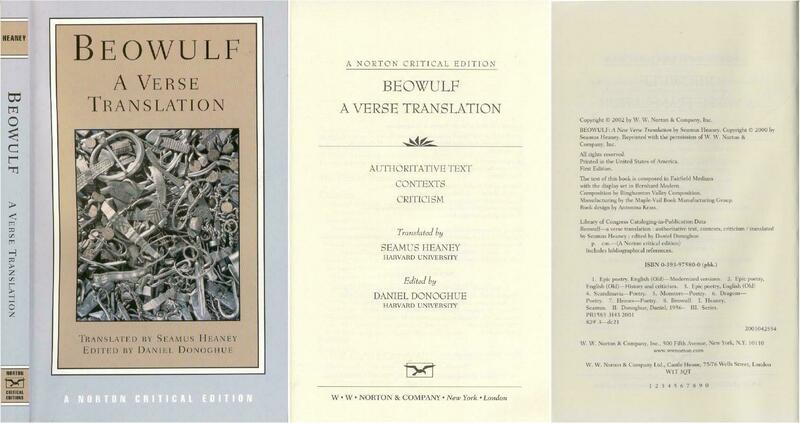 Beowulf: A New Verse Translation.Farrar, Straus and Giroux, New York, 2000. ISBN: 0-374-11119-7 (alk. paper). Beowulf: A Verse Translation. W. W. Norton & Company, Inc., New York, 2002. ISBN: 0-393-97580-0 (pbk.). ...the translation is the same as his 2000 book, but this book does not contain the Old English text. Part of the Norton Critical Edition series. The Seamus Heaney translation (published by Farrar, Straus and Giroux in February, 2000, and also by W. W. Norton & Company in 2002) has attracted media attention by winning the Whitbread Award for Poetry (reported at http://www.whitbread-bookawards.co.uk/). The back of the hardcover edition contains excerpts from reviews which state that "Heaney has created something imperishable and great that is stainless -- stainless, because its force of poetry makes it untouchable by the claw of literalism: it lives singly, as an English language poem" and "The translation itself rides boldly through the reefs of scholarship" and "Heaney's excellent translation has the virtue of being both direct and sophisticated, making previous versions look slightly flowery and antique by comparison". In his Introduction, Seamus Heaney explains that in making his translation from the original Old English, he wished to evoke the language and lyricism of his native Northern Ireland in the days of his childhood. As I read it I often find that he has chosen a word or phrase which strikes me as particularly lyrical or beautiful, and I will say that this is one of my favorite translations. I am certainly no expert (or even much of a fan) of poetry, and I cannot compare the finer points of how the Heaney translation compares to the others, but I would not say that this translation is far superior to all of the others which came before it. Although this version does alliterate and it contains very well-crafted phrases, my favorite translations are still the one by Frederick Rebsamen, the new unfinished online translation by Tim Romano (at http://www.aimsdata.com/tim/beowulf_trans.htm ), and the Bertha Rogers translation. I will say, though, that Seamus Heaney has struck a good balance between plain language and alliterative poetry, and it is probably a little easier to follow the details of the story using his translation than it is using the Rebsamen or Romano versions (the Bertha Rogers version is written in a prose style which is very easy to follow). There is more information about this book on Paul Deane's website at http://alliteration.net/Heaney.html and also at the Internet Poetry Archive, at http://www.ibiblio.org/ipa/heaney/. There are many other translations of Beowulf still available in print, but the marketing people seem to be working overtime to convince everyone that the Seamus Heaney translation is the only one worth reading. The Seamus Heaney translation is one of the best ones available, but it is a little unfortunate, I think, that many people will be greatly influenced by the marketing campaigns, and that they will not give serious consideration to any other translation. In the Preface to his Norton Critical Edition/Seamus Heaney book, Harvard English professor Daniel Donoghue has, in my opinion, gone a little too far in praising the Heaney translation as being superior to all of the other translations which came before it. I would say that there are at least half a dozen other translations which are just as interesting as Seamus Heaney's version.